Despite Israeli efforts to deter Palestinians from taking part in this weekend’s Great March of Return, and in spite of the cold weather conditions which prevailed, a tsunami of demonstrators flocked to Gaza’s 25-mile-long fence. Heavily-armed Israeli forces fired live ammunition at protesters, who came in their thousands to mark one year since the start of the marches. 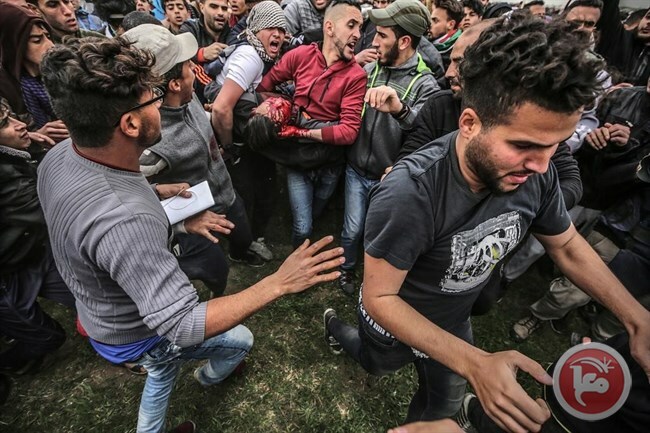 Four Palestinians were killed and dozens injured by Israeli gunfire and tear gas inhalation. The heavily-armed Israeli forces, backed by tanks and warplanes, justified their actions by stating that the protestors came close to the fence, violating a 300-metre enforced buffer zone and hurling stones at soldiers and snipers. The head of Hamas’ military wing, Yahya Al-Sinwar, took part in the day’s protests, showing no fear of being assassinated by Israel. A day earlier, the armed wings of the Palestinian resistance factions warned Israel against killing the protestors en masse.